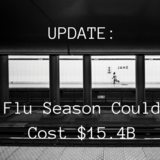 UPDATE 2: Flu Season To Cost Employers $21B | Challenger, Gray & Christmas, Inc.
“The flu season is still going strong and workers continue to fall ill. One potential driver of the spread of the flu could be the open office trend that so many companies implemented in the last decade,” said Andrew Challenger, Vice President of global outplacement consultancy Challenger, Gray & Christmas, Inc.
“When you take away walls, workers are in near constant contact with one another. During an aggressive flu season, this could affect entire companies, especially for the small and mid-size firms and start-ups that so often utilize this concept,” said Challenger. Employers, especially those with open offices and shared workspaces, should treat these spaces and other common areas as gyms treat exercise equipment. This includes daily cleanings of all surfaces with disinfectant. Employers should also keep soap and hand sanitizer in plentiful supply. “Encourage any employees who have been sick to wipe down or clean their briefcases, wallets, phones and/or phone cases, or bags that they bring with them to the office on a daily basis. Basically, do whatever you can to remove germs that could spread this virus,” said Challenger. According to the CDC, the 2009 H1N1 strain sickened an estimated 60.8 million people, with more than 40 million over the age of 18. We estimate about 25 million workers could become sick due to this season’s high flu activity. Expand telecommuting. Determine who can work from home or other locations. This will keep people off of public transportation and out of the office. Encourage employees to wash their hands frequently, avoid handshakes, and take other hygienic precautions, such as wearing a mask in heavily populated work areas.